Using all of the branding, designs, and photography that we created for this project, we also created Instagram templates for Genedor Beauty to use to give their wall a consistent look that not only matches the season, but also goes with their website design. We used the ingredients within their product lines to develop unique and individual templates that told a story about each product while still sticking to their fresh branding design. 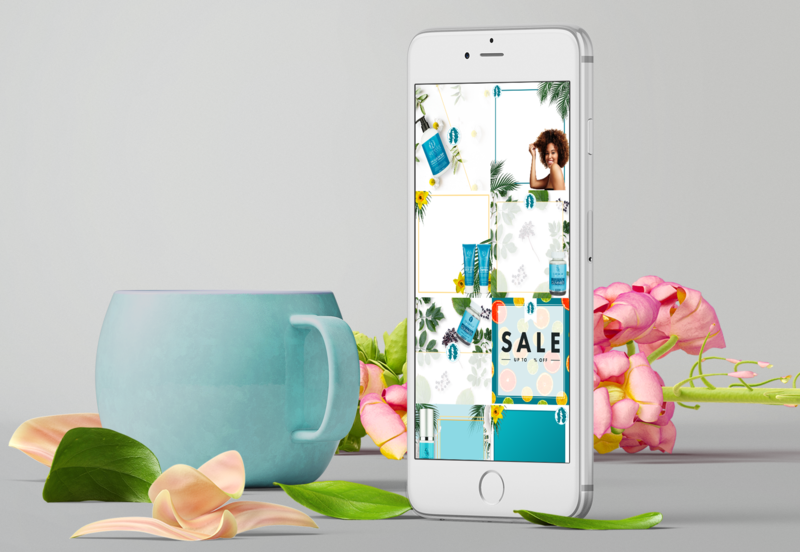 Instagram themes are seasonal for retail, so each season will bring about a new wave of Instagram templates for their team to use. Genedor Beauty will continue to come out with more of their own branded products and our team will create new Instagram templates for the team to explore with that allows their customers to see more of what goes into Genedor Beauty’s awesome product line! With only a month to revamp their Shopify web design and after creating their branding guides, we took to updating their web design. Not only did we have to ensure that the design had a friendly and easy to use user experience on a computer, tablet and mobile phone, we were also tasked with differentiating each of their collections and pages as well as producing new pages. The day before launch, we also were given an additional rush project to create a new page which included a slew of new images and graphic design, but we were able to get the project completed without a hiccup. Our team created and revamped many website assets and pages using the branding that we had in place and the end result was a fun, tropical and refreshing look & feel that the client adored! The previous product photos all had a grey background and didn’t give their website design that clean and fresh look that they were going for. 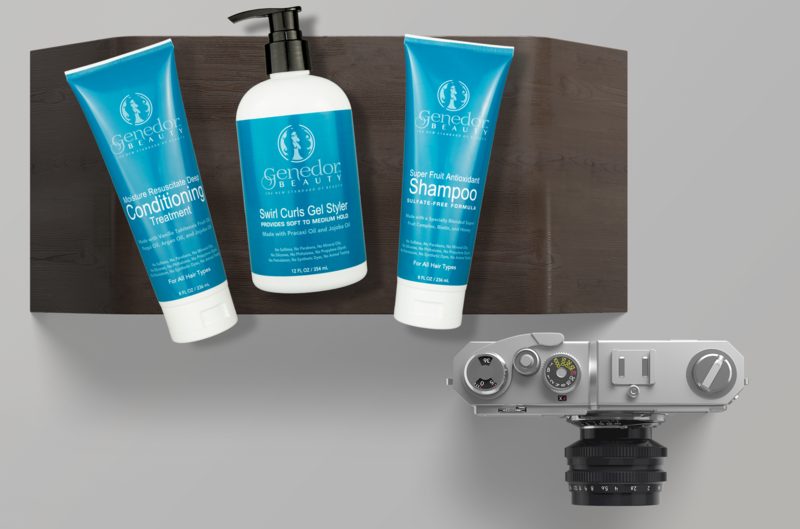 Although the client didn’t initially request product photography, we suggested that we take new product photos to remove the grey background so that we could have clean photos to use the products in both the product listings for the online store as well as for designs that show the products in different situations. With beautiful new product photos, we could now have images that could be used on their website pages and on social media – just like you see in the image here! We met with our client locally to exchange information, ideas, and to learn more about their products. The ease for our team to meet with clients in-person to have dynamic and knowledge-filled meetings allowed us to turn around this project quickly and efficiently. 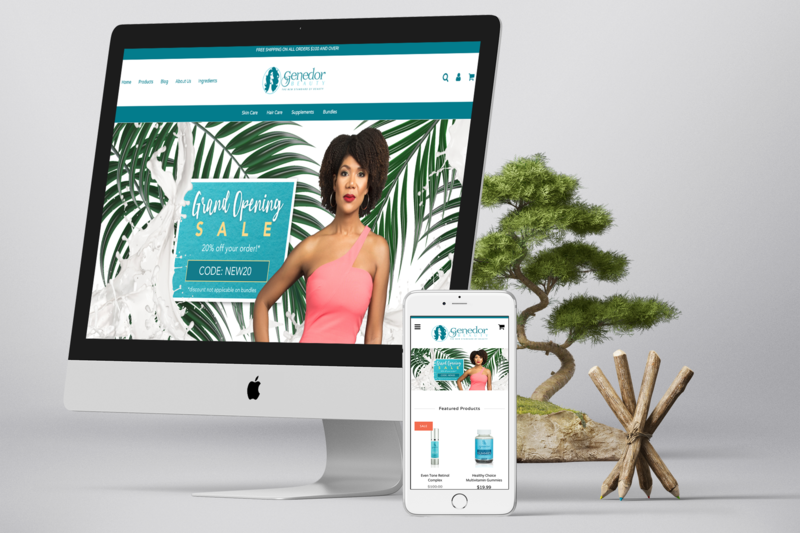 Genedor Beauty was kicking off their first online retail store in the summer of 2017 and needed a fresh new look, with only a month available before launch. Using the two colors available from their already existing product and logo, our design team created a guide for us to follow that ensures that their branding is consistent throughout online media, printed media and for conference events. 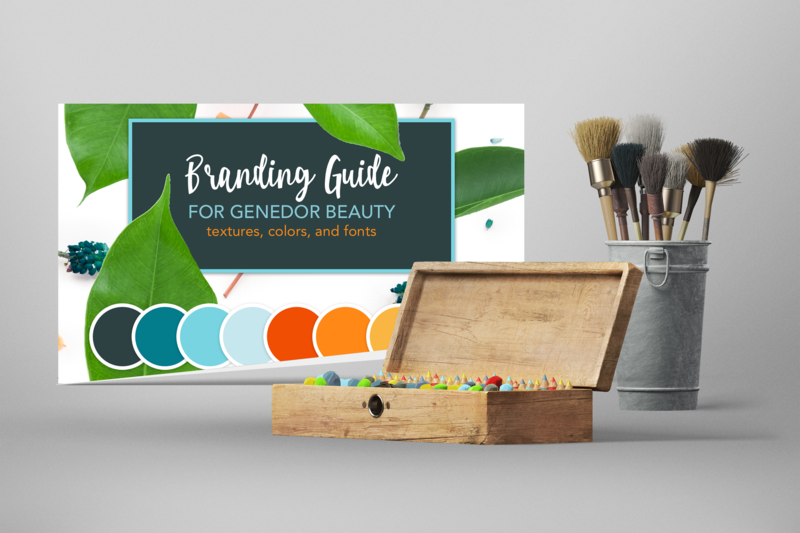 We gave Genedor Beauty new colors to use to help their current branding pop that could be easily translated through many different seasons through the year. From florals to greenery and pops of color, we have created a wonderful palette and use fun typography to give that extra bit of flair that keeps their branding fun and fresh!